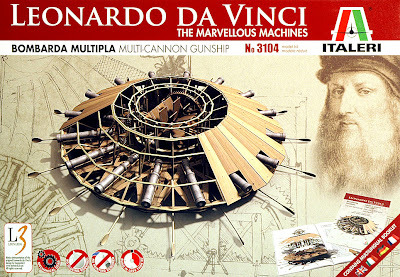 Interest in the works of Leonardo da Vinci continues with the arrival of yet another kit of his inventions. This latest from Italeri in 'The Marvellous Machines' series, markets a kit originated by South Korea's Academy Plastic Model Co, and is one of the best-known Leonardo designs. Here it is termed the Multi-Cannon Gunship, though it's perhaps more generally considered as a very early tank design. As with most of Leonardo inventions, he did various sketches of the device, some showing more detail than others. 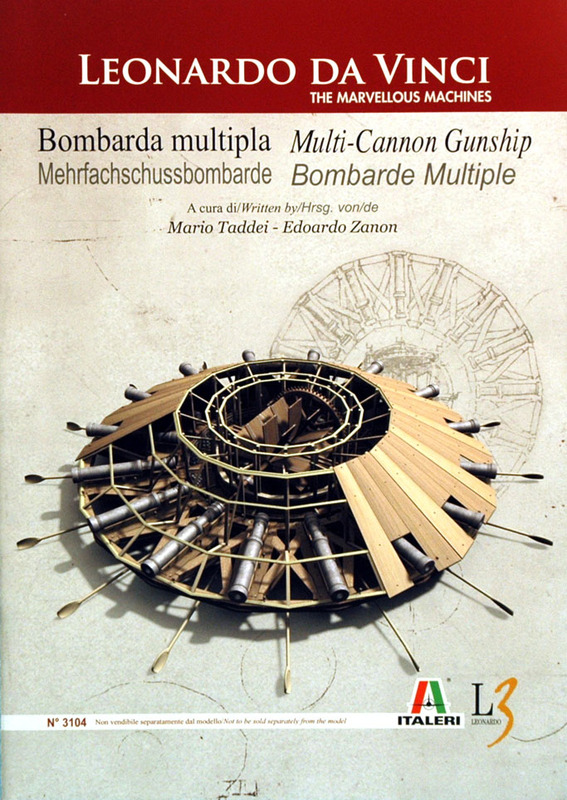 One sketch shows a more basic design, equipped with just a few cannon, but the Italeri model has a grand total of 16 barrels, firing through a full 360 degrees. 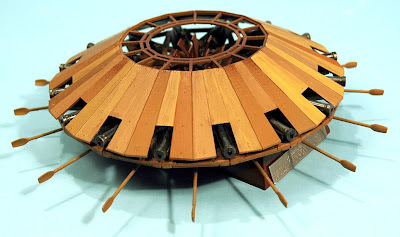 Experts realised this big-Bertha version would have been too big for land travel, but as it appeared to be paddle-powered, it was almost certainly intended for water - hence Italeri’s waterborne gunship. The kit has 54 plastic components moulded in two shades, with three parts for a base and two nameplates. 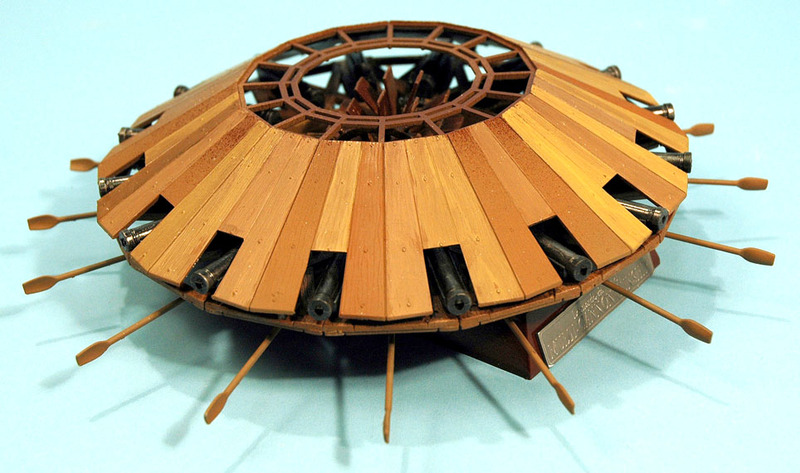 The model can be assembled ‘as is’ with no painting, but - given that the whole assembly would have been mainly wood - it does allow you to add wood panels in various shades. 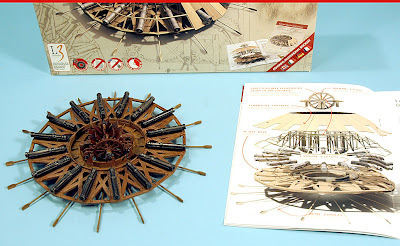 Unlike some previous Leonardo kits that have included a pre-assembled clockwork motor, this one has a prototypical representation of the proposed propulsion method - human-powered cog wheels, turning a pair of large paddlewheels. Whether the cog-paddle mechanicals were practical in the real world is doubtful, but the mechanical principles - as with the vast majority of Leonardo’s inventions - were sound. Also in the kit is a four-language detailed booklet on the inventions, with Leonardo’s own sketches, plus reproductions of originals in the British Museum and the Royal Collection at Windsor. These are augmented with modern computer-generated interpretations that show the ideas in greater clarity. A scale is indicated in the booklet, though frankly the dimensions given appear wrong. Instead, comparing the illustrations against the 159 mm (6.25 in) diameter assembled tank, and the number of likely crew, the kit works out to approximately 1:100 scale. At this size a Renaissance-period crewman would be about 18 mm (0.7 in) high. The 16 cannon were spaced around the gunship’s circumference, and in a very early form of ‘production line’ manufacture, each unit was identical, so they could be made on an assembly line. 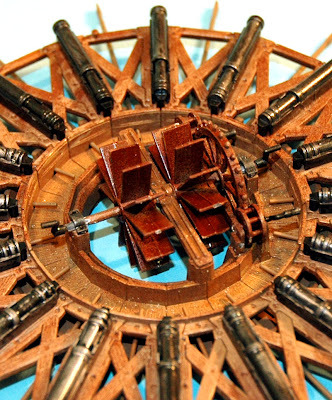 Steering would be by altering the differential speeds of the two main paddles, but there also appear to be paddles under the cannon, presumably to aid manoeuvring. All in all, a neat little kit that has historical value, and is probably to one of the recognized model scales into the bargain. If you’re even mildly into the ‘Renaissance Man’, a kit that’s definitely recommended. Review kit supplied by Italeri’s UK importers and distributors, The Hobby Company. The Gunship is available here.